The Nicaraguan capital of Managua is the perfect introduction to this Central American paradise. It is an ideal starting point for exploring the country, situated as it is on the banks of Lake Managua and midway between Leon and Granada. With its name derived from the indigenous Nahuatl language, Managua means 'town surrounded by water'. In recent times, Managua carries a reputation as being the 'Venice of Central America' because of the makeshift canals snaking through the city. Managua divides into pre- and post-earthquake areas. Two major earthquakes devastated the town in 1931 and 1972, forcing residents to build businesses and residential areas outside of Managua rather than in the centre of town, which still contains older buildings not structurally designed to withstand earthquakes. The rebuilt Managua does not seem to follow a particular layout system, and shopping malls, residential areas, and parks are scattered throughout the city. Zona Rosa and Metrocentro are the main tourist areas. The city is the cultural and political hub of Nicaragua. It is also central to trade and industry, evident in the frenetic activity and constant buzz. Visitors to Managua will be delighted by the city's combination of old and new, and its natural beauty, surrounded as it is by volcanoes, lakes, mountains, and lagoons. Getting around in Managua can be tricky because of extensive earthquake damage. Years of major quakes and tremors have left many parts of central Managua without proper addresses or street names. Using the lake as a point of reference is particularly useful whether you're using a hired car, taxis, or public buses. 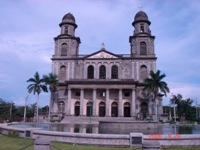 Managua boasts a number of tourist attractions, including the National Museum, National Palace, and the old and damaged Managua Cathedral. The town has a selection of quaint markets where tourists can buy everything from ethnic mementos and souvenirs to colourful hammocks and paintings. The capital city charms visitors to Nicaragua, enthralled by its natural beauty and scenic surroundings.